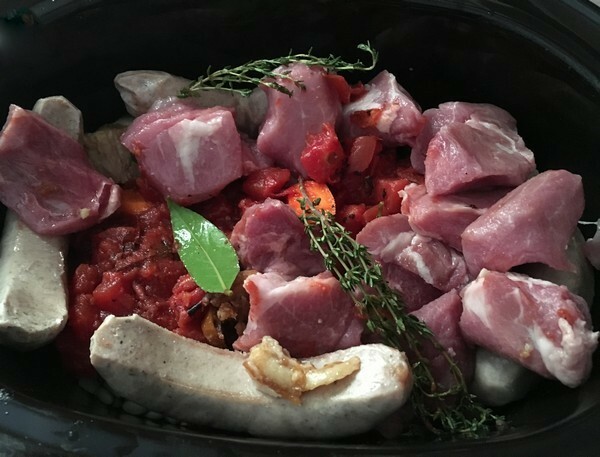 Cassoulet, slow cooker, all ingredients on hand, cold weather, dinner, time for the Accidental Locavore to start cooking! This recipe was on the NY Times Cooking site and serves 4 or more. Combine beans, crushed garlic, onion, carrots, tomatoes, thyme, bay leaves and meats in a slow cooker, and turn heat to high. You can brown the sausages and duck legs in a skillet before, if you’d like. Add stock or water to cover by 2 inches. Cover and cook until beans and meats are tender, 5 to 6 hours on high heat, 7 hours or more on low. When done, add salt and pepper to taste, along with minced garlic. If you like, remove cassoulet from slow cooker, and place in a deep casserole; cover with bread crumbs and roast at 400 ° until bread crumbs brown, about 15 minutes. Garnish, serve and enjoy! 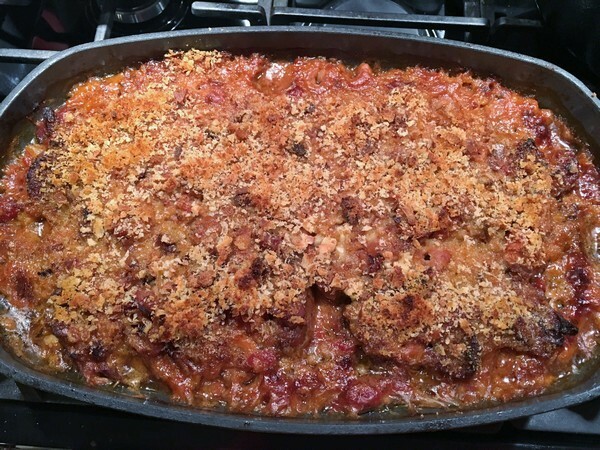 My verdict: Three caveats before I begin: I’ve never been a big fan of Mark Bittman, but was intrigued by the idea of an easy cassoulet. If you think something is weird in a recipe, trust your gut and figure out a work-around. Finally, you have to cook with love and if you don’t things never taste as good. This was made in a series of bad-mood days and it was reflected in the finished product. You’ve probably gotten the idea that this wasn’t one of my better meals. As a matter of fact, it was one of the worst. It started out with good ingredients, beautiful dried beans, sausages (breakfast, not Italian – really Mark?) from Four Legs Farm, ditto the pork shoulder. 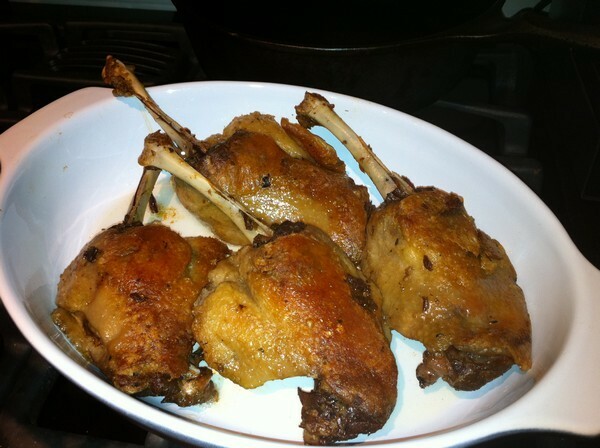 I had homemade duck legs confit and breadcrumbs from a recent baguette. First sign of trouble – ignoring the warning signs in my head that the beans should have been soaked overnight before going in the pot. After the first day of cooking (and it was more than the 5-7 hours given) the beans were rock hard and inedible. The pot went on the back porch to cool down, we went out to eat. Long story short, I cooked everything for about three days, before the beans were tender enough to eat. By that time, we were both well over our cassoulet cravings, so we foisted it off as dinner on an unknowing, but very polite friend (sorry Laura!). It was essentially mush, and what might have been distinct flavors on day one or two, were just different textures. So, except for the buttermilk biscuits I use for making strawberry shortcakes, I’m through with Bittman! But not cassoulet – I had a great one in Nice! If you’re thinking this looks familiar, the Accidental Locavore has been revisiting this shepherd’s pie recipe for a contest. Comfort food gets sophisticated in this grown-up shepherd’s pie with kale and potatoes from the Greenmarket. 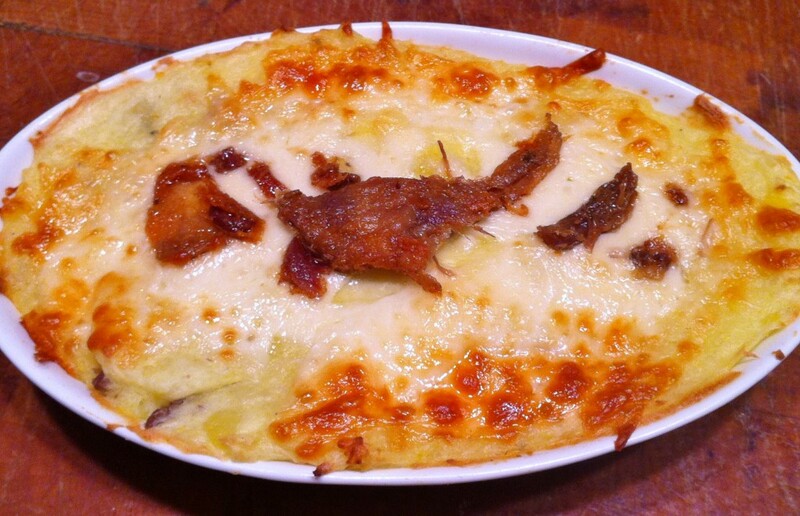 I tossed together mashed potatoes, duck confit and kale, then topped with cheese for a decadent dinner. This will feed 4 people. The Accidental Locavore makes a sophisticated recipe for a grown-up shepherd’s pie. The main course recipe combines mashed potatoes, duck confit, kale and cheese. Preheat the oven to 375°. Peel and quarter the potatoes. In a medium sauce pan over high heat, cook the potatoes in salted water until tender about 15 minutes. Remove from the heat, drain and return to the pan. Add 2 tablespoons of the butter, milk, salt and pepper and mash the potatoes with a hand masher or electric mixer. Set aside. In a large sauté pan over medium-high heat, add half the olive oil and the duck legs, skin side down. Cook for about 5 minutes, until the skin has started to crisp up, and is dark golden brown. Flip the legs over, and cook for another 3 minutes. Remove from the pan and set aside. Remove the ribs from the kale and coarsely chop. Peel and finely mince the garlic. Add the rest of the olive oil, garlic and kale to the pan (that the duck legs were in). 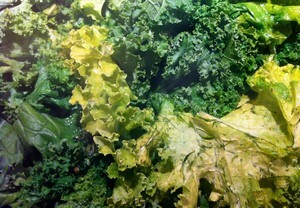 Toss the kale to coat with the olive oil. As the kale begins to wilt, cover with a lid and turn the heat down to medium and cook until just wilted, about 4 minutes. While the kale is cooking, remove the skin from the duck legs and set aside. Remove the meat from the duck legs, shred into large pieces and set aside. Grate the cheese, using the medium sized holes on the grater and set aside. With the remaining tablespoon of butter, lightly grease a 8 ½”x11” oven-proof gratin pan, or 3 individual pans. Put an even layer of kale on the bottom of the pan, add the shredded duck confit and top with the mashed potatoes. Sprinkle the grated cheese on top. Garnish with the reserved duck skin. Bake until the cheese is melted and golden brown, about 15 minutes. Serve and enjoy. My verdict: Still a winner. 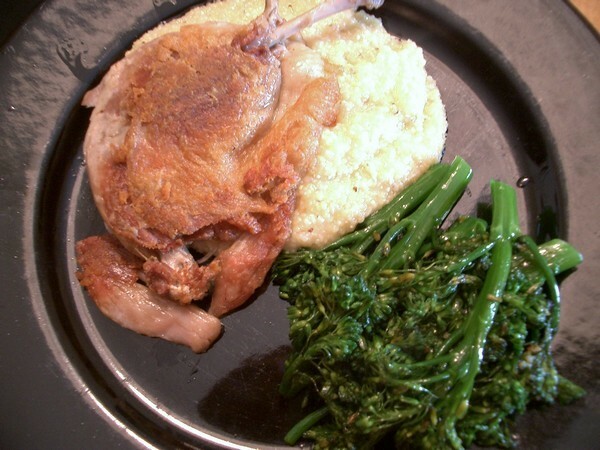 The kale cuts some of the richness of the duck confit and adds a healthy green veg to make it a complete meal. If you don’t have a couple of duck legs confit lying around, a lot of gourmet markets carry them or you can order them from D’Artganan. In the spirit of year-end round-ups, the Accidental Locavore offers up my top 10 list for 2011. The first half of the list are the posts you liked the best, the second half, my favorites. 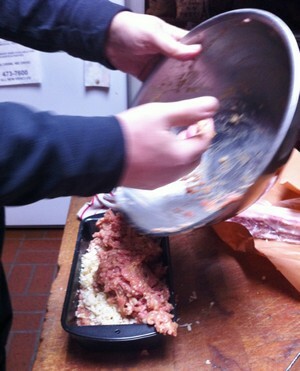 My husband Frank’s recipe for his amazing meatloaf. If you haven’t tried it yet, find a night when comfort food is a must-have and give it a try! Cooking on my Himalayan pink salt block. This makes me a little sad because the tomato season was cut so short this year, I never got to try tomatoes and mozzarella on the chilled salt block. However there are steaks (beef and beefsteak) in my future! The recipe for short ribs cooked in beer. Whether you do them in the oven or slow cooker, these are delicious and easy! If you’re one of the people who got a slow cooker for Christmas, break it in with this recipe. The Accidental Locavore’s virtual “throw-down” with Daniel Boulud. My first attempt at making merguez and the results? Pork chops with scalloped potatoes. From the “Cook-Along” series, this is a recipe best saved for February. Why? It’s a “hearty winter dish” and after a month or so, New Year’s resolutions are pretty much forgotten, right? And the Locavore’s personal favorites? 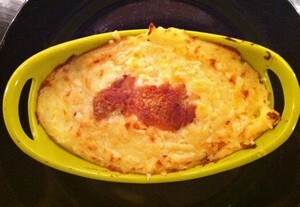 Duck confit shepherd’s pie. This is so delicious, a little healthy (kale) and a great excuse to make another batch of duck confit. Got a problem with that? Tomatoes as water balloons. These pet peeves from farmers at the Greenmarkets, made me realize how we all could brush-up on our farmer’s market etiquette. Pay attention all you corn shuckers out there! What happened in the aftermath of Hurricane Irene (this was written before the October blizzard). It’s important for all of us to understand how badly the farmers were affected and to do whatever we can to support them. Join a CSA, buy local and shop Greenmarkets or farm stands. On a more ironic note, Whole Foods 5-step program for chicken and other meats. While the Locavore supports sustainability and humanely-raised animals, how many toys my chicken had growing up can’t possibly affect the flavor of the end product. And if anyone out there can tell the difference between a #1 chicken and a #5, please let me know! And because it’s one of my favorite stories that was just waiting for the proper time to be told, the tale of the WafflePro 800. Do you have a favorite that I might have forgotten? Here’s to a happy, healthy and prosperous 2012! The secret? Sous-vide. If you’re not familiar with sous-vide, it’s a way of cooking something for a long time in simmering water. Think sophisticated boil-in-a-bag, but oh, so much better! To start: I prepared a couple of duck legs with a dry rub and let them sit overnight in the fridge. The next day, after a quick peek at Thomas Keller’s Under Pressure: Cooking Sous Vide, I rinsed them thoroughly, patted them dry and put them in a vacuum bag with a nice coating of duck fat. Vacuum sealed them and put them in a water bath in my slow cooker. Eight hours later, tender to the touch, they were done. The next night for dinner, I crisped up my duck leg (nibbling all the while). While that was cooking, I made some polenta with some local stone ground corn meal. To add a note of bitterness to the meal and maybe a bit of healthy eating, the Locavore steamed some broccolini (wanted broccoli rabe, but there was none to be found in three local markets, what’s up with that?) and after the duck was nicely crisped, tossed the broccolini in the pan with the remaining fat and some sliced garlic for a couple of minutes. The result? Amazing! There was the lusciousness of the duck against the great texture of the polenta, with the slight bite of the broccolini. Cooking it sous-vide really brought the texture of the confit to another level. The last batch I made was good, but didn’t have the melt-in-your-mouth scrumptiousness of this one. Another advantage? It didn’t take nearly as much duck fat as the traditional way and when it was done and cooled, the fat and the jelly part (needed for rillettes, stay tuned) separated cleanly. What’s next? Certainly more duck confit! But now the Accidental Locavore is really curious to play with some more food sous-vide. Anyone out there have any sous-vide favorites?